I did not know anything about Sahar Speaks: it all happened when Afghan Women Writing Project editor, Susan Postlewaite, sent me the link of the new training program for journalists. She encouraged me to participate. “Sitara go for it! If you need I will recommend you,” she said. I became really excited and decided to ‘go for it’ as Susan told me. I never thought I would get the chance to participate in a wonderful program that would change my destiny. I have taken part in many training programs for Afghan women and they were usually constructed as income-making projects. But this one was different: there was love, friendship, energy and learning. It’s where I was introduced to the idea of “Never Give Up,” according to Amie. I am a reporter and English translator at the parliament of Afghanistan, and in addition, a writer and poet at the Afghan Women Writing Project since 2011. My first degree is in history and I am completing my second degree in political science at the American University of Afghanistan. Female journalism is as important as male journalism. Women can only gain their rights by raising their voice, and this happens via media. But here, women can only share their story with a female journalist, not a male one. A woman will feel comfortable to speak and reveal her untold story to a female journalist. That is how Afghan womens’ voices reach the world. Amie Ferris-Rotman is a British-American journalist who has worked in many countries, including Afghanistan. She has received the John S. Knight Journalist Fellowship. Amie is the founder of Sahar Speaks, a new training program to develop Afghan female journalists. This knowledgeable and experienced woman and her photographer husband travelled to Kabul to train us. They were so supportive of us. Though it was not part of the program he taught us how to take photographs and selfies. I and eleven other young and energetic girls were the first team to receive training on how to share our stories with international media. As I started the first day of training, in early March this year, I thought I knew everything about journalism because I had taken a three and a half-month journalism course. Ha! Our very first mentor, journalism trainer Lisa Essex, certainly changed my mind, teaching us what we really needed to do to create a good news story. I was very impressed by Lisa because on her first day in Afghanistan she broke her hand, and she still came to Sahar Speaks to work with us. I knew she was in pain but she did not allow it to show on her face. Instead she was so warm and friendly with us, so committed. When she told of how she was hit by a bike and Afghan men and women helped her to stand I felt really happy and proud of their behavior. Though she had this bad experience on her first trip to Afghanistan, it seemed she liked Afghan people and was happy here. I realized that we are not anti-foreigners, something that the foreign news outlets sometimes show. Every day at Sahar Speaks we learned something new. On the second day an Iranian photographer showed us her work. It was fantastic. She showed us her project about a gay couple’s life in Iran. For me it was amazing that a very religious family’s son was gay and his family supported him instead of insisting he leave their home. When their son had transgender surgery to become a woman his family still supported him. I did not know what to say except WOW! In Afghanistan it is really hard for a photographer to work on such as project or find gay couples who will let a photographer show their private live. Sahar Speaks was not only a training program for journalists but it was also a great opportunity for twelve motivated women who were determined to work for change. At lunchtime we talked about women’s challenges and shared our ideas about how to deal with them. Our trainers listened to us and encouraged us. We became like a family and were very open with each other. Amie gave us quizzes and while we all were very competitive it started with a laugh and ended with a laugh. Since the end of the training, I have had stories published about Afghan female musicians and the growth of female student sport clubs at the American University of Afghanistan by Huffington Post and Bistands Aktuelt respectively. 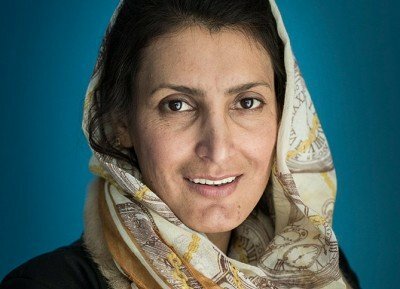 I have many untold stories regarding women and children’s issues in Afghanistan to cover, and I am looking for international media to publish them. Huffington Post, media sponsor of Sahar Speaks, has published stories of all twelve Sahar Speaks alumni, which you can read here. BAAG is a partner of Sahar Speaks, working with Amie to develop the programme and secure funding and additional partnerships.